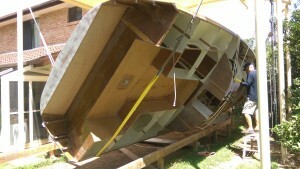 The turn over of our Didi 40 Cr hull went according to plan today. I was confident enough to invite people to come and help and watch but nervous nevertheless. 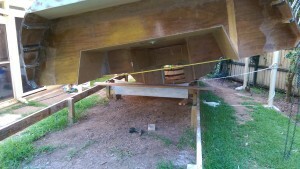 We started the job right on 10 am and used the chain blocks to lift one side of the hull. The rope wrapped four time around the hull was meant to turn the boat but it kept slipping on the shiny painted surface so we used the chain plate frames as attachment points for the turning ropes. 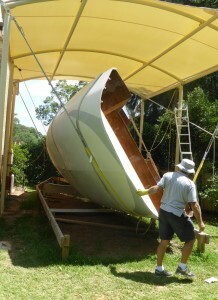 Once we had a firm pull on the hull it turned readily in the slings. 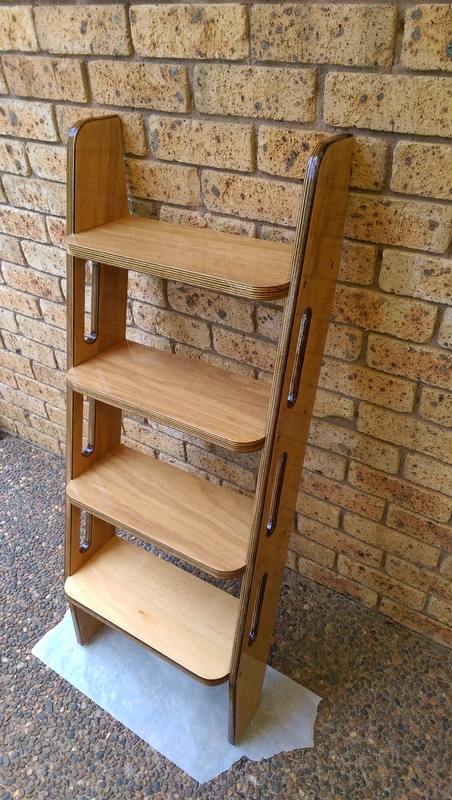 Soon our main concern was preventing it toppling over once the centre of gravity went over the top. Again rope attached to the chain plate frames was used as a steady as the hull slipped slowly in the slings into the upright position. 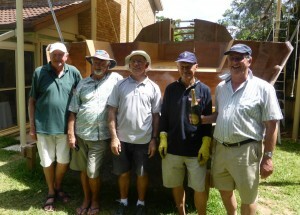 Once the hull was level it was time for a break and to celebrate with a sip of champagne. Tonight there are tarpaulins over the bow and stern where the hull protrudes from under the awning. Today I liberated the DIdi 40 Cr hull from the building frame in preparation for turning it on Monday. The task went to plan and I applied just enough tension on the chain blocks that connected to the slings holding the hull so that the hull did not slip lower on the frame. 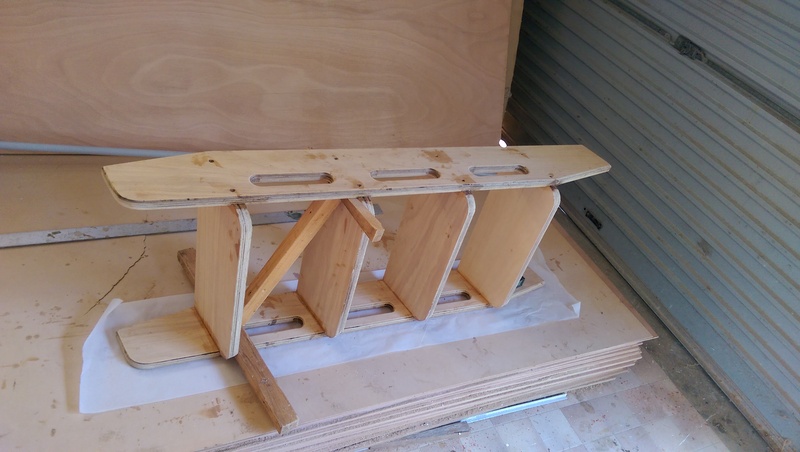 As I progressed from stern to bow I had released eight of the twelve supports before the supports started to lift away from the reference marks. 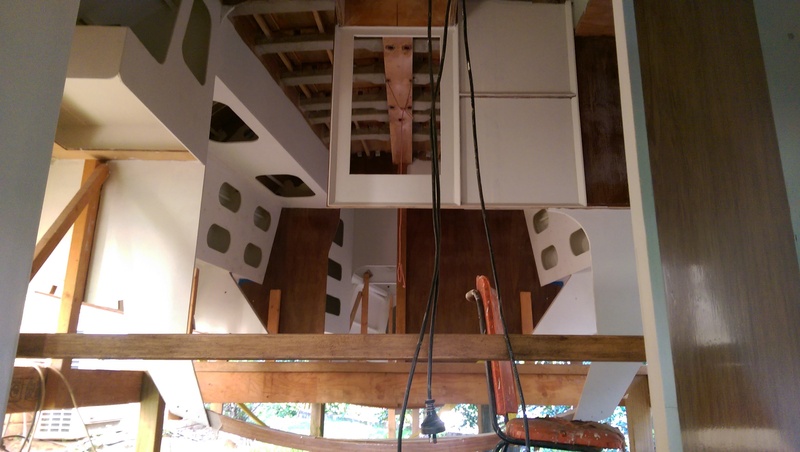 Once all the supports were released I raised the hull high enough to fit the rear cradle to the building frame. That will be completed tomorrow in time for the turn on Monday. Yes it is starting to lift off the building frame. The aft cradle is positioned ready for level measurement and securing to the building frame. The warm night and light breeze tempted a large crowd to stay for the post race BBQ at the Greenwich Flying Squadron. Hopefully the pleasant atmosphere and good food made up for the disappointment of some of the crews who found themselves a few hundred metres short of the finish line when the breeze died. Indeed at 10 pm when I was putting Passion back on the mooring at Woolwich there was no detectable breeze. Sitting on the start line like a Laser does not work for a 6,400 kg yacht and so we were passed by Gwhizz and Saoirse to leeward and Izzi to windward. 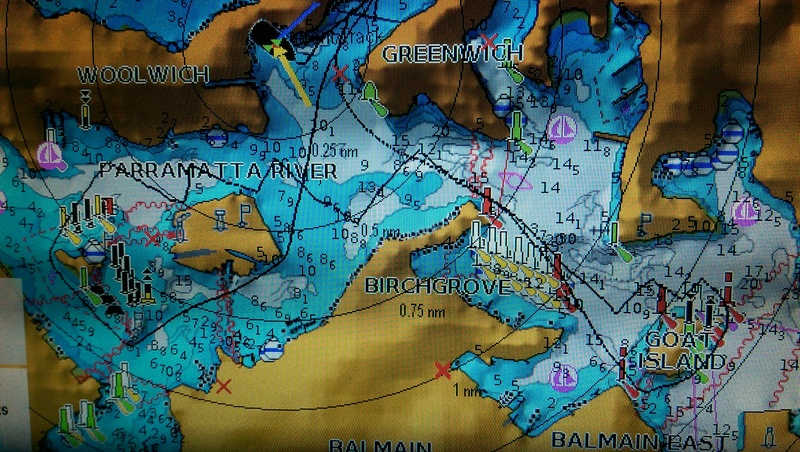 While we made the tight reach into Humbug in good order once we turned for the broad reach to Cockatoo Island we were blanketed by the following fleet. In one of our least successful downwind legs we were passed by the whole fleet. Normally we would give Cockatoo Island a wide berth but the wind was still fresh and we had the full rig up so I chanced a line a little closer that usual and we were rewarded with a lift above the tail enders. Now we had an outgoing tide to help and after crossing tacks twice with French Connection we ended up on the right side of a lift which gave us a good gap. In front we had Tartan, Saoirse, Worlds Apart, Izzi and Gwhizz to catch and they were a long way in front. In the beat around Goat Island we passed Tartan who stayed on our hip all the way back to Humbug. Worlds Apart with their distinctive large mainsail with the Jeanneau logo was not far ahead and Saoirse was in between. Izzi was up near Worlds Apart and finished ten seconds in front of her while G Whizz was out in front all alone. 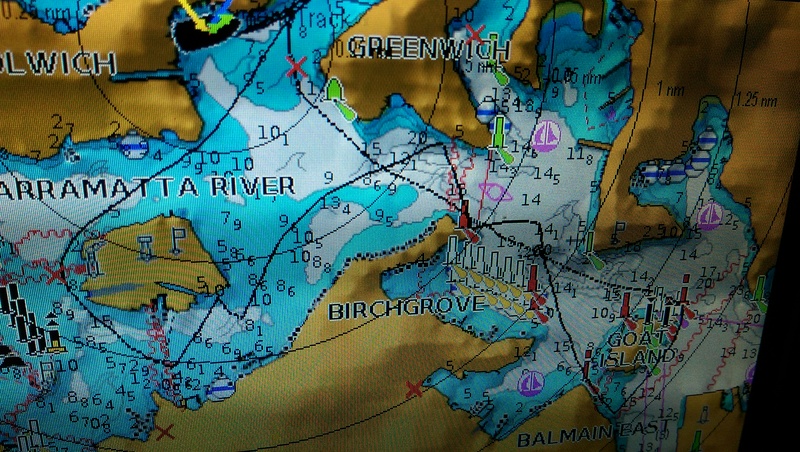 Luckily for us Saoirse and Tartan went too close in to Greenwich and slowed in the wind shadow. 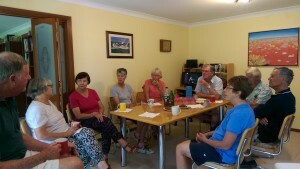 By the time they escaped from the windless zone we were well away and enough away to beat them on handicap. The rest of the fleet struggled home in dying breeze so the early finishers were the handicap winners on the night. For our troubles we collected the mandatory bottle of wind at the results presentation. Light airs and an outgoing tide produce some good tacking angles. 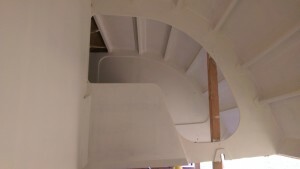 Cannot resist a photo of the access stairs now that I have a second coat of clear epoxy on them. Also a close up of the quality of the plywood used in the stairs and also in the hull. Another alteration I have installed is 12 mm plywood reinforcement over the keel in two places where there is a splice join. 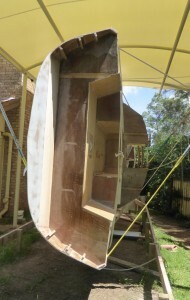 Dudley’s plan already has plywood across the centre line join down the keel on the outside of the hull. 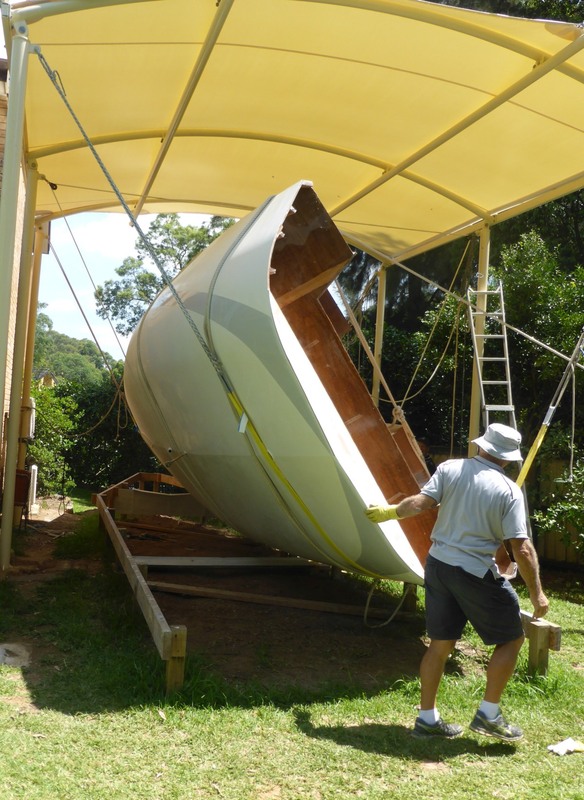 This provides considerable cross grain strength to the keel. 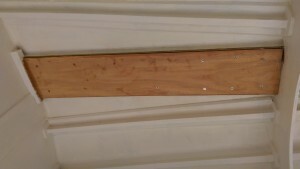 I have added the 12 mm plywood to give cross grain strength in the inside of the keel as well as stiffness along the section. So effectively there is a sandwich construction with ply on both sides of the meranti keel. Each 12 mm piece of plywood weights approx 2 kg so for 4 kg additional weight low down on the keel I get a lot of insurance. 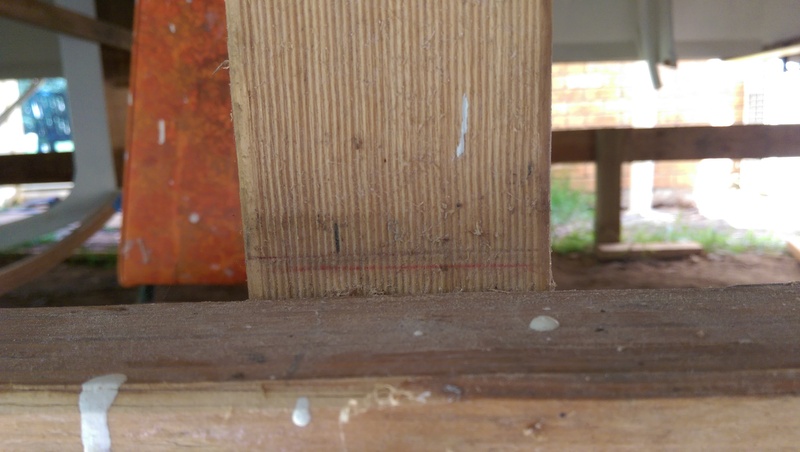 I added these because the meranti backbone has a massive amount of cross grain reinforcement in the keel floor area and then nothing extra in the quite wide spans between the frames fore and aft of the keel. 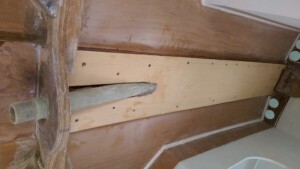 12 mm plywood reinforcement across the keel at a splice join in the meranti backbone. The companionway stairs for our Didi 40 Cr already looking good with just two coats of clear epoxy. More to come. 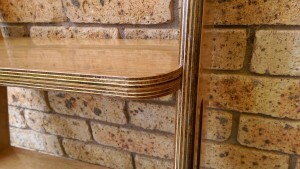 A close up of the 24 mm thick plywood stairs construction. 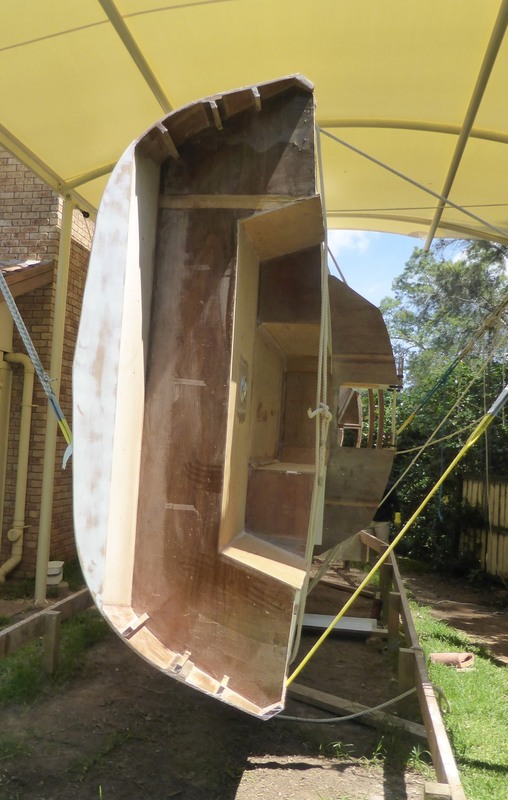 This is the same plywood used in the hull of our Didi 40 Cr in 12 mm thickness. We have another short week for boat building so I am doing fill in jobs. 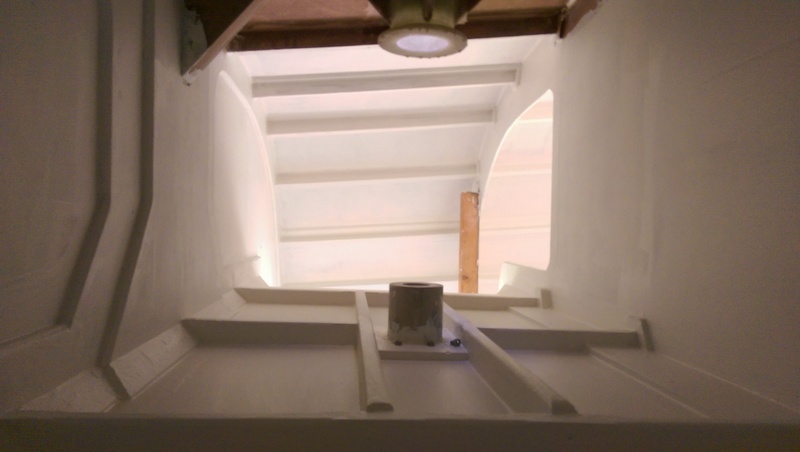 Today I made the access ladder which will be very handy once the hull is turned and another job off the list. 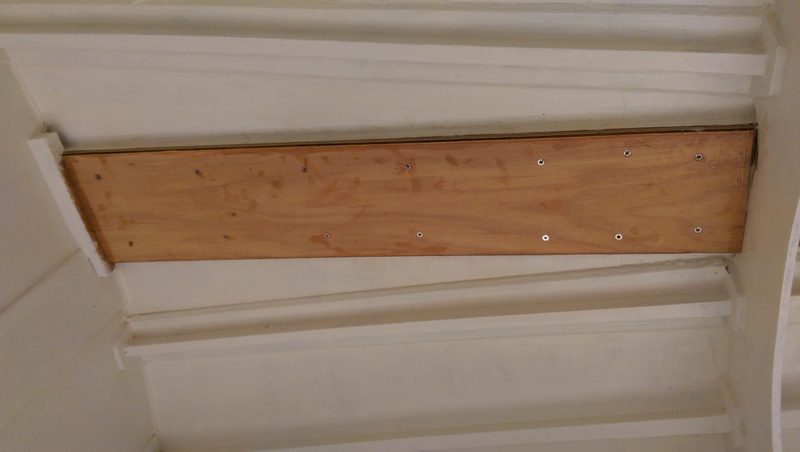 Yesterday I skipped sailing the Laser and glued up some 12 mm plywood to make 24 mm plywood planks for the steps and rails. 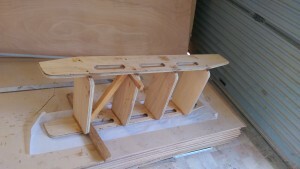 It took all of today to shape the components and glue them together. 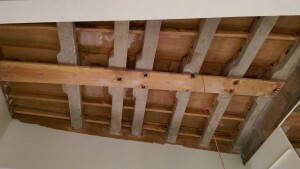 The photo shows some temporary cross bracing to keep the structure square until the glue cures. The plans for the Didi 40 Cr comprise the original plans for the Didi 38 plus some additional frame details for the extended Didi 40 Cr. The ladder is further aft in the Didi 40 Cr so some adjustment to the profile shown in the Didi 38 was needed. I also measured up the stairs on our Sun Odyssey 37, Passion, and was surprised to find that the tread depth and height are exactly the same. 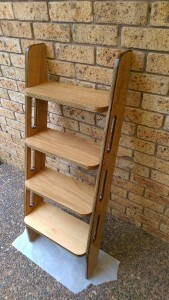 Passion’s treads are made from 24 mm ply so I thought I would do the same on the new boat. I had considered installing the water heater under the stairs but there is not enough space. The bottom of the wet locker in the head is however the right size and it will make the bottom of the locker a similar depth to Passion. Most days I spend a couple of hours sanding the roller pattern off the last coat of Interprotect. 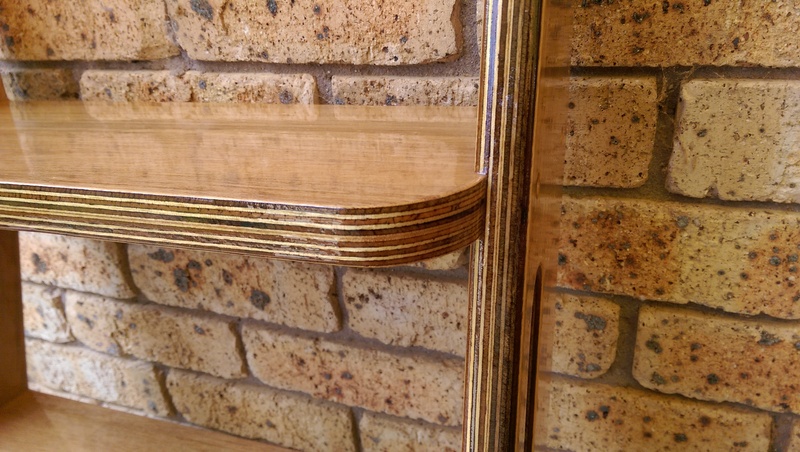 It has cured to a very hard surface so I should have done this job within three days of the last coat. The access ladder for our Didi 40 Cr. Tonight was all about avoiding mistakes. The north east breeze was forecast to die out before a late southerly front so we set the large black genoa in anticipation that by the time we had run down the south side of Cockatoo Island the breeze would have abated. The sail selection worked to plan as we won the race out of Humbug. We were aided in no small part by Gwhizz going high under the Greenwich hill and carrying Worlds Apart and Agrovation with her. French Connection and Izzi went low as we did and we three emerged well in front of the pack. Izzi won the run down the south side of Cockatoo but only by a couple of boat lengths. She undid all her good work by taking the corner at Schnapper Island so close that she ran aground and we had to take avoiding action. Izzi’s problem left us with a small gap to French Connection and with Saoirse stopping to assist Izzi there was one less close follower. On the beat back to Goat Island French Connection got on the winning side of one shift to make up ground but then went off to the north while we played the shifts up the track. From the approach to Goat Island all the way back to Greenwich Flying Squadron we had to contend with light shifty conditions. All the time we could see Worlds Apart making ground on us only to fall into the same quiet patch we had just traversed and so the lead widened again. As we crossed the line the southerly started to come through bringing the back markers through the fleet with speed so Gwhizz was a close second and Farrst Company made up a lot of ground to give her a handicap chance. 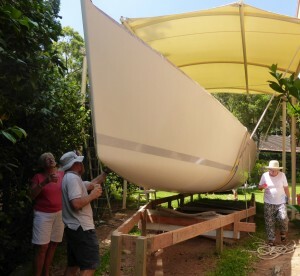 I missed my self imposed deadline of the end of January to turn the hull partly due to wet weather but more to do with family matters which will keep us occupied this week. There is no rush to turn the hull and leave the inside exposed to the elements and I have a lot of jobs that can still be completed with the hull upside down. 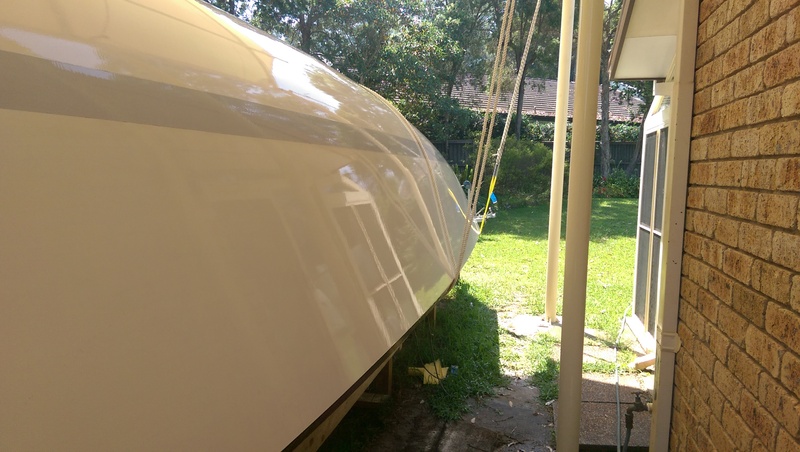 Today was a big sanding and painting day and now the huge aft locker is coated with two coats of white epoxy primer on top of the two or three coats of clear epoxy. Not only is the timber more protected but the interior is lightened up considerably. 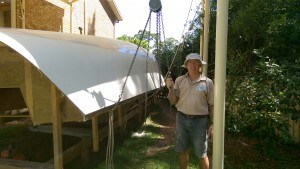 I have rigged up one of the slings to lift the hull and used the two tonne chain block to take up the load. 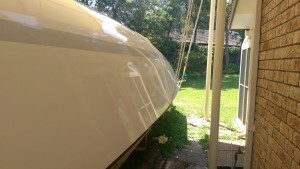 It is so tempting to fit the other sling and lift the hull but I will be patient. A view across the area where the rudder stock will go. The steering quadrant for the autopilot will go on the rudder stock in this area. You can see how the widened aft cockpit reduces the volume of the locker but there is still plenty of volume and enough full length area for the long items. A view through the companionway. I will need the ladder soon to get into and out of the hull.